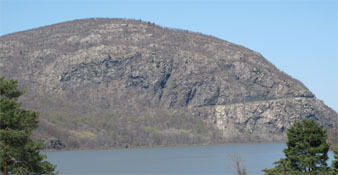 Take the Metro North Hudson Line train from Grand Central station to the Cold Spring station. Walk in the same direction as the train to get to Main Street. Walk up Main Street (east, away from the river) for 2 blocks. Turn left onto Fair Street. Route 287 to Taconic Parkway. North to Bear Mountain Parkway to Route 9. North on Route 9 to 403. Right onto Route 9D. Follow Route 9D for about 3.5 miles. At the traffic light in Cold Spring, turn left onto Main Street. Go 4 blocks. Turn right onto Fair Street. North on the Palisades Parkway to the Bear Mountain Bridge. Cross the bridge and turn left onto Route 9D North. Follow Route 9D North for 12 miles. At the traffic light in Cold Spring, turn left onto Main Street. Go 4 blocks. Turn right onto Fair Street.